Name: Bob Sanders Backpacking Background: I went on my first backpacking trip as a Boy Scout at the age of 16. Over the years I have hiked the Wonderland Trail in Washington and section hiked parts of the Florida Trail, Appalachian Trail, Colorado Trail and 740 mi (1191 km) of the Pacific Crest Trail. I continue to backpack and hike year round in the Colorado mountains. I have evolved from a heavyweight backpacker to a lightweight backpacker and sometimes reach ultralight weights. My three day spring/summer solo adventures (using a tarp) have me hovering around a 10 lb (4.5 kg) base weight. This is a documentary that follows a half dozen of the 300 or so hikers that annually attempt a thru-hike of the Pacific Crest Trail (PCT). The DVD appears to be professionally produced as the graphics on the DVD cover/sleeve are very well done. There is a map of the PCT on the inside cover. The website is also very well designed and includes an introductory video, photos and descriptions of the participants, maps and facts about the PCT and photos and bios of the film makers. I have personally hiked approx. 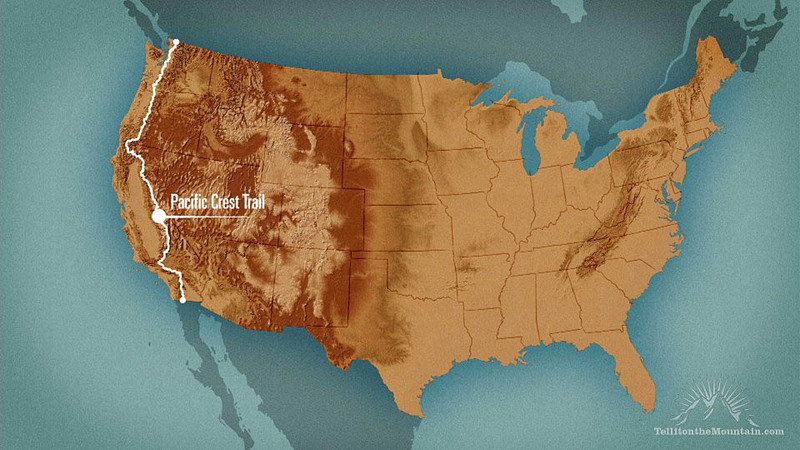 740 miles of the PCT starting at the Mexican border and heading north. 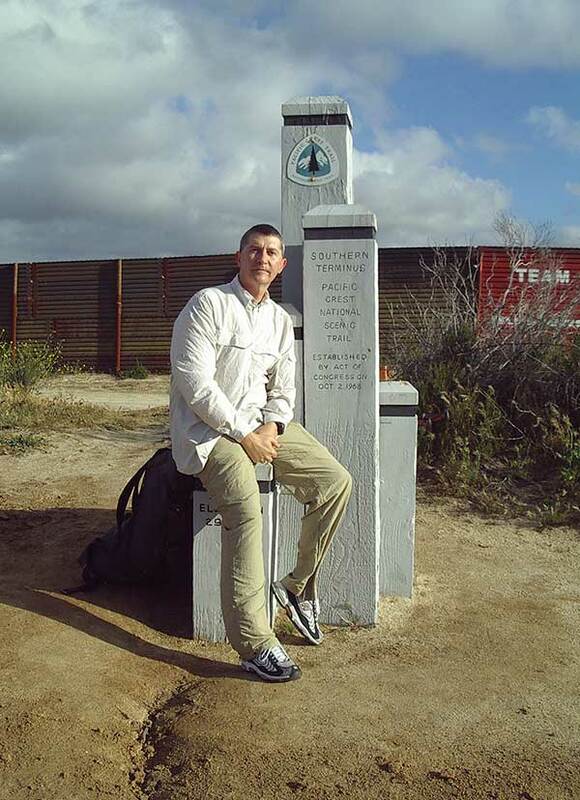 I couldn't resist but here is a shot of me back in 2003 at the southern terminus of the PCT. I am sure watching the documentary of the journey will bring back a lot of great memories for me. Check back shortly for my Long Term Report. This movie/documentary is very well done. The photography and cinematography is a nice mix of professionally shot segments mixed in with hand-held shots by the participants. The editing, sound track, voice over and graphics are also very well done. Everything about this DVD has an air of professionalism. After finishing my first viewing of the film I came away with the feeling that anyone who is interested in attempting such an adventure should buy this DVD and watch it several times. Even the armchair adventurer will appreciate this film. I wish it had been available before I attempted my thru-hike back in 2003. 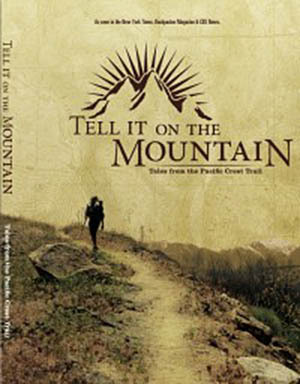 There is a wealth of information out there about the technical or physical side of the Pacific Crest Trail. Things like, what gear to take, where to find water, what towns to pick up supplies in, when to go, and how many miles to cover. But this film takes more of an emotional view of the trail. I really like that about this film. The focus was really about the people and the adventure. After watching just the first 10 minutes and the introduction of the main characters I began to remember all the really cool people I had met while on the trail. Especially the trail angels. I have actually met one of the characters in the film, Donna Saufley and her husband. I stayed at their house in Aqua Dulce in California. The brief segment in the film that shows their property and the people there does not do it justice. The two of them really do have hearts of gold and open their home and share their resources to all the hikers that show up. Everything from feeding them, washing their clothes to letting them use their truck to go into town. There are many angels along the way, some you meet and others you just experience their love and hospitality. Wonderful people, the trail experience would not be the same without them. The film basically follows 2 couples and 4 solo hikers on their personal journeys to hike this incredibly beautiful trail that winds through the deserts and mountains from Mexico to Canada. All of the participants are quite varied in their experience level and knowledge of the PCT. Everything from first time hikers to 7-time thru-hikers. And each one of them had a different idea and reason for why they were on the trail. Another nice aspect is they included participants from other countries. The film is comprised of little snippets of each participant talking to a hand held camera, while on the trail or in their tent at night describing what is going on in their lives at that very moment on the trail. And the rest of the film is documentary style by a professional film crew doing interviews and following the participants during their journey. They stay behind the scenes and you never see or hear them. Not to give too much away but what you see and experience is the motivation, the failure, the pain, the blisters, injuries, the food, the weather, the beautiful scenery, the terrifying obstacles, a wedding, the love & friendship, the perseverance and finally the triumph of completion. It really was quite inspiring. And all of it from 6 different perspectives. I found myself saying "humm, am I too old to think about trying this again"? And then I remember one of the participants, a retired 70 something, bearded gentleman who's trail name is "Billy Goat". Basically every spring he hits the trail in April and returns home to his wife in September. He does it year after year. I think I might still have a shot at this. Better start training. I would like to thank BackpackGearTest.org and Shaun Carrigan for the opportunity to test this DVD.